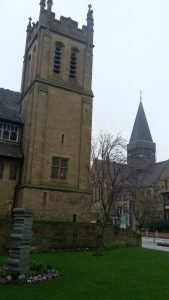 Hate Crime on university campus has attracted widespread attention in the media of late, with a spate of high profile incidents targeting Black Asian and Minority Ethnic (BAME) students in particular in the UK. Despite increased awareness of it, it is estimated that hate crime is considerably under-reported by students (Universities UK, 2016; NUS, 2012). BU’s Equality and Diversity Unit, supported by Dr James Palfreman-Kay, was awarded funding by HEFCE in late 2017 as part of their Catalyst Fund to tackle hate crime and online harassment on campus. This is a joint project, working with partners in SUBU, CPS Wessex, Dorset Police, Access Dorset, the Dorset Police and Crime Commissioner as well as colleagues and academics at BU and from other agencies associated with Prejudice Free Dorset. The objective of the project was to provide students with the knowledge of what a hate crime is, how to respond to it and where to seek support, both on and off campus. This was achieved through the use of a drama based format called Forum Theatre (FT) which uses actors to share scenes of discrimination and hate crime (Dwyer, 2010; Hamel, 2015). FT has previously been used in promoting social change and critical thinking (Boal, 1974) and the value of this approach was that it would enable students to try out courses of action which could be applicable to their everyday lives and provide a gateway for increasing reporting. The project is funded for the remainder of 2018, and a pilot was run in March with a cohort of social science Level 4 students. 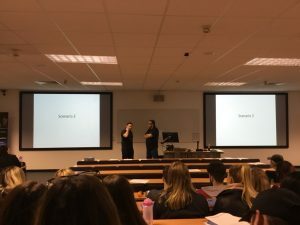 Jane Healy, Lecturer in Sociology & Crime & Deviance, worked with James to embed the Forum Theatre process within a learning session with 85 students from across BA Sociology, BA Sociology & Criminology, and BA Sociology & Anthropology programmes. 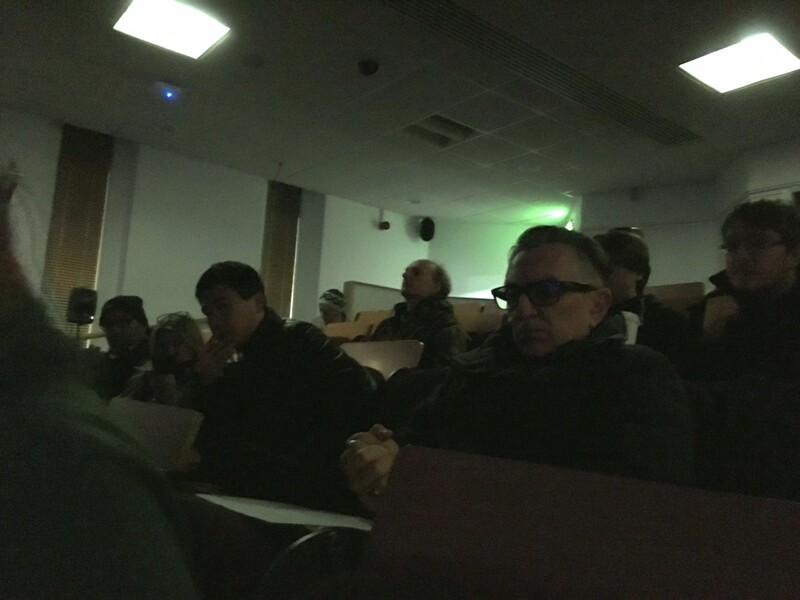 The students were exploring Hate Crime as one element of their Level 4 Social Exclusion and Discrimination Unit, and the FT company were invited into the Wollstonecraft lecture theatre on the Lansdowne site. Four actors created two scenarios based on a fictitious university campus, involving religious and homophobic hate crimes but also acknowledging other, intersecting elements of identity. The scenarios were drawn from examples of similarly reported crimes provided by CPS Wessex. None had occurred at BU, but were designed to engage students and encourage discussion and debate. The students were thoroughly engaged in the FT scenarios. As the first scenario was played out, silence descended on the room and students (and staff) held their breath as the ‘student’ characters experienced an unpleasant encounter near their halls of residence. The second involved online hate crime and the impact it had on victims, friends and bystanders. Once the scenes were completed, actors returned to the stage in their ‘roles’ and students were able to ask questions of them. The response was at times rambunctious as members of the audience quizzed and at times challenged ‘bystanders’ about their participation. 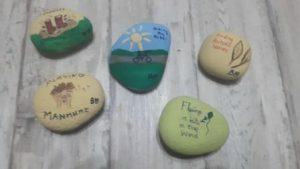 Ultimately, however, the serious message of hate crime as a corrosive and socially divisive aspect of contemporary society was conveyed in a respectful and thought-provoking manner. In order to evaluate the success of the programme, students were asked about their knowledge of hate crime both before and after the FT event and what impact it has had on them, through an evaluation questionnaire. 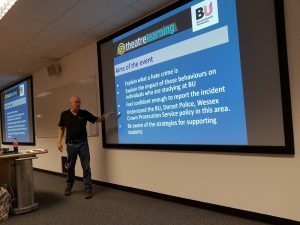 Initial findings suggest an improved awareness of hate crime, although some students unfortunately had previous experience of hate crimes and incidents. Students are also being invited to do a follow up interview. The FT event provided a unique method of engaging with and debating hate crimes on campus, in a safe and respectful environment. Embedding it within a Unit enabled the project’s exposure to a large cohort. As a result of positive feedback, it will be rolled out across all three sociology programme year groups over the coming months. Interested in attending the next Forum Theatre? There are two further forum theatre open events on Campus before the end of term; 23 April in Lansdowne and 17 May on Talbot. Details can be found at the bottom of this post. However, any interested academics and/or teaching staff can contact James to discuss a bespoke session to suit their student cohort. By raising awareness and increasing reporting, BU is sending a positive message that hate crime, in all its forms, is unacceptable. Jane Healy has recently completed a PhD in disablist hate crimes and is a Lecturer in Sociology & Crime & Deviance in the Faculty of Health & Social Sciences. Global Traction in the USA! New York is the world’s media capital and it is no surprise that American academic institutions dominate the field of Media Management. Fordham University in New York extended an invitation to me as a Visiting Scholar, and as a Santander Universities Network partner, the process of engaging with them was straight forward. My application to the Santander Mobility Scheme had 3 primary objectives which fused research, education and professional practice. During my visit to the USA, I taught on Fordham’s MSc Media Management programme, had discussions with leading media management scholars and the Editor of The International Journal on Media Management. I also met with the Managing Director of the Boston Consulting Group to discuss the metrics that are used to measure the level of innovation in firms, as well as their the chronic under performance. I also had a meeting with the Editor of Strategy & Leadership to discuss developing a ‘Masterclass’ paper on Scenario Planning and how best to encourage Early Career Researchers to write for the journal. All of this activity aims to develop a number of fusion based outputs and impacts into the near and medium term future. Overall, it was a great trip and many thanks to the Santander Staff Mobility Scheme! Are you interested in testing an App developed at BU and designed to lower blood pressure? We are continuing to recruit for 2 studies involving our Brythm App, designed at BU. Brythm is based on the principles of slow and deep breathing that have been found to lower blood pressure. Our previous research supports the idea that changing the way you breathe has an impact upon your heart rate and blood pressure. We have developed an App (called Brythm) to exploit the beneficial influence of breathing, which guides users to a personalised, optimal breathing frequency. We are currently conducting one study on healthy women in a laboratory setting to test the cardiovascular responses to slow and deep breathing, which would require approx 2 hours of your time. The other study involves using the App daily at home for 8 weeks to test the feasibility of using the App. For both studies participants will receive information about their current blood pressure. Participants must be female non-smokers of reproductive age (18-49 years) who are not currently pregnant. They must also have no prior medical diagnosis of cardiovascular or respiratory disease (including asthma). The entire study requires a single visit to the Cardiorespiratory Research Laboratory in Bournemouth House (3rd floor) lasting approximately 2 hours. During this visit you will be asked to undertake a number of 5-minute sets of slow and deep breathing, guided by our App, while a series of non-invasive and painless cardiovascular measurements are made. The App will be installed on our iPad in the lab and you will not be required to use your own device. Participants must be aged 40 or over and you must have access to an iOS or Android device capable of downloading and running the Brythm App. More details on device specifications available on request. You will be expected to complete daily 10-minute sessions using the Brythm App for 8 weeks and will have an initial meeting with our Project Manager prior to commencing the study, where you will be given a demonstration of the Brythm App and be given an opportunity to try it for a few minutes. You will also receive an automated blood pressure monitor to take home with you for the duration of the study; you will be asked to use it to make two measurements each day, which will be recorded via the Brythm App. Following the intervention we will ask you to attend a focus group where you will be invited to share your experiences of using the App. 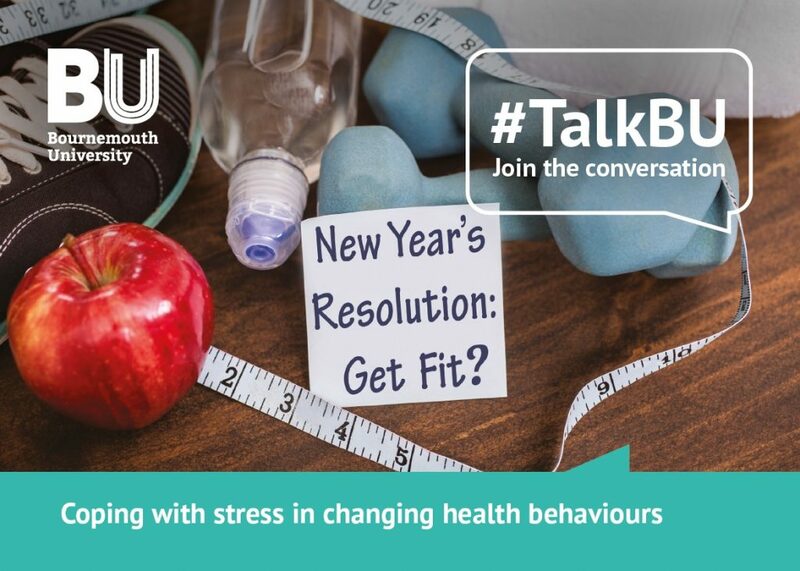 For more information, and to receive a participant information sheet outlining either study in more detail, please contact Malika Felton at mfelton@bournemouth.ac.uk or 01202 961845. Every year the British Association of Sport and Exercise Sciences (BASES) organise the student conference, as an opportunity to discuss and exchange views on contemporary issues in sport and exercise science (including clinical exercise, biomechanics, performance, physiology and psychology). This year the venue is Northumbria University, and the programme includes international speakers from the applied and research worlds. The conference started with the lecture “not all that can be counted counts – why we should listen to Einstein?” by Mrs Esme Matthew & Miss Laura Needham, who brought they experience as members of English Institute of Sport (EIS) and their work with the UK Olympic team. It was particularly inspiring to see how the lab works moved into the field of applied science and the relationship that bound researchers and athletes. Mr Dray, and his work on the effect of high-intensity interval training on obese men. Mr Parmar about the difference in maximal aerobic speed in filed-based tests compared to laboratory-based treadmill tests. Miss McNulty on low-volume, high-intensity priming activity. Miss White and his work on plyometric training team gym gymnasts. Mr Addey about the effect of unilateral strength training on recreation runners. 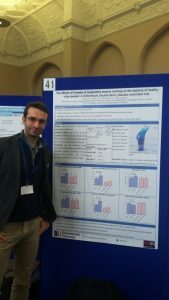 Then, it was the time for poster exhibition, where I presented my research titled: “The effects of 8 weeks of inspiratory muscle training (IMT) on the balance of healthy older people: a randomised, double-blind, placebo controlled trial”. I was excited, and most important the comments and feedback collected satisfied my expectations. In particularly I had the chance to discuss IMT with a couple of students from Portsmouth, that today are going to present their works on IMT in athletes. I also met Mr Tahmosybayat, and his research on 6 weeks of exergaming compare to OTAGO exercise training in healthy older adults and we discussed the outcomes, methods and methodologies of our research. After there was a range of workshops available from which I chose “a demonstration of how exergaming is used to improve postural control” by Dr Gill Barry at the sport central physiology lab. Here members of the lab staff showed us their facilities in particular exergame, Kinect, and Biodex BioSway and how they measure balance in frail populations. At the end of the conference, there was still time for the lectures on “contemporary recovery: translating research to application” by Dr Jonathan Leeder, Dr Jess Hill & Mr Luke Gupta. Who discussed how to optimising recovery following exercises, the efficacy of compression garments on recovery from strenuous exercises and sleep management in elite sports. 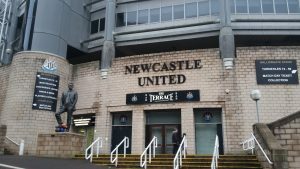 Then we moved to the home of Newcastle United FC, where before dinner we had a motivational/inspiring speech by Mr Nick Grantham specialist in athletic preparation, combat sports and strength training. Concluding, it was a very productive day and I am looking toward tomorrow where there are going to be more lectures, oral presentations and posters oriented on frail populations and nutrition. Charlotte is a midwife and in her first year of doctoral studies in FHSS, exploring the impact that living on a low income has on women’s experiences of pregnancy, maternity care and parenting. Charlotte recently applied to BU’s ‘destination summer school programme’ in Indonesia and her application was successful. The programme will take place at the BINUS University in Jakarta, Indonesia in June 2018 and is designed for students from BU and BINUS University to work together on projects that address one or more of the Sustainable Development Goals (SDG). The SDG’s are a collection of 17 goals set by the United Nations for countries to work towards achieving. The goals are interrelated although each has its own targets and they cover a broad range of social and economic development issues. These include poverty, hunger, health, education, climate change, gender equality, water, sanitation, energy, environment and social justice. 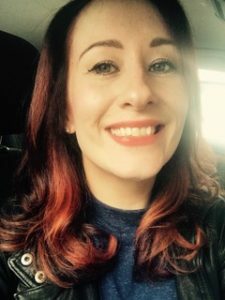 Charlotte says, ‘Collaborating with others on these projects will foster the development of my global mind-set and enhance my competence as a researcher interested in health and social sciences research’. Charlotte applied to the programme for the opportunity to develop her knowledge of issues such as poverty and gender equality, both of which are relevant to her research topic. In order for Charlotte’s research to be impactful and authentic she believed it important to listen to and learn from others and hopes the summer school programme will assist her in achieving this. Charlotte will translate the knowledge gained from the experience into her own research and competence as an early-career researcher. Charlotte looks forward to being able to share these experiences with you all on her return. We report here on a successful programme of research, involving engagement with public policy, aimed at reducing the scourge of economic crime. If accepted the proposals made would have a substantial impact on frauds involving major companies, especially those in the financial services sector. Economic crime takes many forms: from traditional manifestations of fraud, bribery, money-laundering and tax evasion to modern slavery and human-trafficking offences providing forced labour. Striking at the heart of global security, funding terrorism and political espionage, it also inflicts direct costs to businesses and economies, nationally and world-wide. Fraud alone is calculated to have cost the UK economy c. £190 billion (2017) while global estimates reveal a loss of £2.75 trillion (2013). Focusing on corporate criminality, in March 2017, we responded to the Ministry of Justice Call for Evidence on Corporate Liability for Economic Crime. We argued that the current preference for corporate liability premised on the company’s failure to prevent criminal misconduct, as exemplified in the Bribery Act 2010, has little application in the context of widespread frauds emanating from “criminogenic” corporate cultures. Central to our proposals were a unique approach to attributing corporate dishonesty, through the adoption of a Criminal Practice Direction, and a shift of resources from regulation and compliance to investigation and prosecution of serious fraud. In March and April 2018, we went on to publish our full results in a series of two articles in the Company Lawyer: New models of corporate criminality: the development and relative effectiveness of “failure to prevent” offences; and New models of corporate criminality: the problem of corporate fraud – prevention or cure? The General Editor of The Company Lawyer is Professor Barry Rider, Cambridge University, who was honoured in 2014 with the award of an OBE for services to the prevention of economic crime. 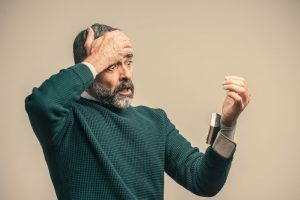 The research for these articles was wide-ranging with many questions that needed to be asked, from the definition of fraud itself and the scale of economic crime to the relative effectiveness of models that could be employed to tackle corporate fraud. Traditional “black letter” law research was useful for some aspects, for example, the analysis of the Bribery Act 2010 and its extension in the Criminal Finances Act 2017 in relation to offshore tax evasion. Other questions required substantial historical research, such as the law’s response to the particular problem of bribery and the precedents for the successful use of a “failure to prevent” model of criminality. The impact of reforms and potential reforms required a detailed analysis of recent prosecutions and the use of deferred prosecution agreements. On Sunday 18th March 2018, the Independent reported Solicitor-General Robert Buckland MP as saying there is a “strong case” for a new corporate economic crime offence. We anticipate that our timely research will prove valuable in shaping the debate as to what the law should be and how it can be made to work. As part of the new plan BU2025, “we want to continue to develop our global partnerships and links with other institutions and organisations”. This is an admirable aim, and it is, of course, the best way forward for a truly global Higher Education Institution like Bournemouth University (BU). But to translate this general aim into a particular global partnership we need to consider the underlying processes of initiating and developing such partnerships. We published a paper  on the issues one needs to consider in developing a partnership, based on the example of BU’s partnership with Manmohan Memorial Institute of Health Sciences (MMIHS) in Nepal. 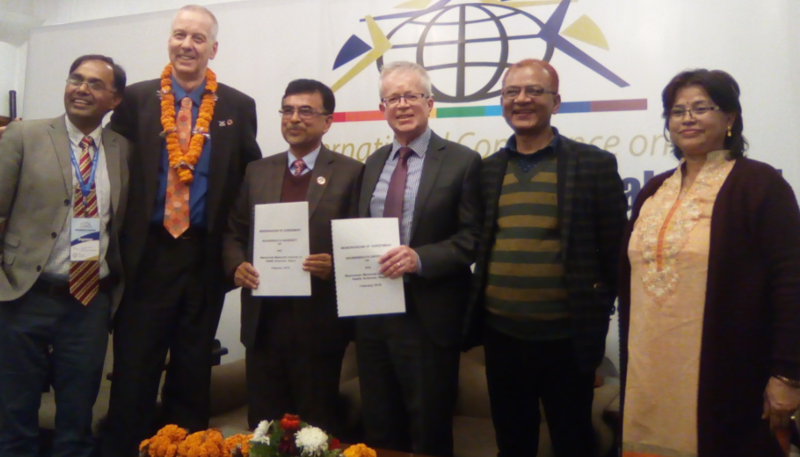 In late February this year MMIHS signed a Memorandum of Agreement (MoA) with BU at a ceremony in the Nepalese capital Kathmandu, where Prof. Stephen Tee represented BU. This MOA is an agreement between us that provides a basis on which the parties will consider potential future collaboration. The UoA formalises a long-standing collaboration between the two institutions, and indicates a desire to collaborate further in the future. MMIHS and BU academics have jointly applied for research grants, conducted collaborative research and published together and it is exactly this personal link between people that allows this, and many other, global partnerships to flourish. 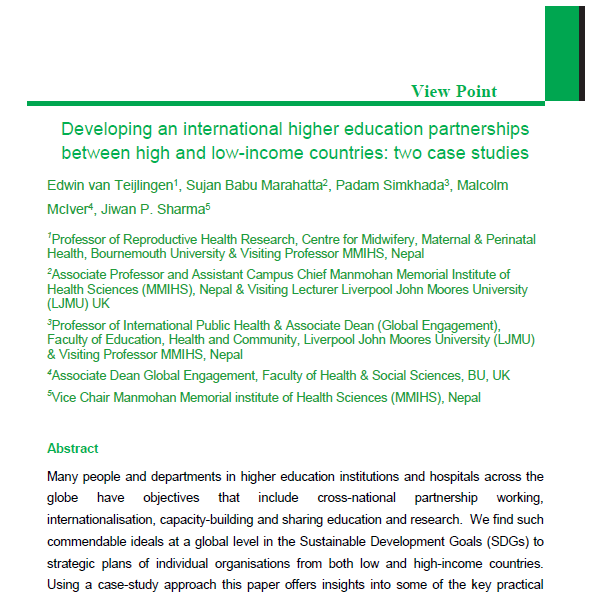 van Teijlingen, E., Marahatta, S.B., Simkhada, P., McIver, M., Sharma, J.P. (2017) Developing an international higher education partnerships between high & low-income countries: two case studies J Manmohan Memorial Inst Health Sci, 3(1): 94-100. Congratulations to two Faculty of Health & Social Sciences PhD students, Preeti Mahato and Elizabeth Waikhaka, who co-authored a paper published in the WHO South-East Asia Journal of Public Health. Their paper is called ‘Social autopsy: a potential health-promotion tool for preventing maternal mortality in low-income countries’. Co-authors include Dr. Puspa Pant from the Centre for Child and Adolescent Health, University of the West of England (Bristol) and Dr. Animesh Biswas based at the Reproductive & Child Health Department, Centre for Injury Prevention & Research, Bangladesh (CIPRB) in the capital of Bangladesh, Dhaka. The authors argue that verbal autopsy is used to attribute a clinical cause to a maternal death. The aim of social autopsy is to determine the non-clinical contributing factors. A social autopsy of a maternal death is a group interaction with the family of the deceased woman and her wider local community, where facilitators explore the social causes of the death and identify improvements needed. Although still relatively new, the process has proved useful to capture data for policy-makers on the social determinants of maternal deaths. This article highlights the potential role of social autopsy in health promotion. Mahato, P.K, Waithaka, E., van Teijlingen, E., Pant, P.R., Biswas, A. 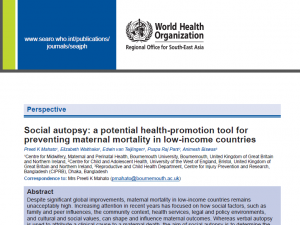 (2018) Social autopsy: a potential health-promotion tool for preventing maternal mortality in low-income countries. WHO South-East Asia Journal of Public Health 7(1): 24–28. The Creative Industries Sector Deal has been announced. You can read the document here. As part of a Creative Industries Sector Deal, to be announced today by the Digital and Culture Secretary Matt Hancock, Business Secretary Greg Clark and Co-Chair of the CIC, Nicola Mendelsohn, more than £150 million is being jointly invested by government and industry to help cultural and creative businesses across Britain thrive. Improving the nations skills is at the heart of the government’s modern Industrial Strategy and to ensure the industry has the skilled workers it needs to deliver this, up to £2 million will be made available to kickstart an industry-led skills package, including a creative careers programme which will reach at least 2,000 schools and 600,000 pupils in 2 years. A new London Screen Academy, with places for up to 1000 students, will also open in 2019. After a consultation proposing changes to the UK Quality Code for HE, (you can read BU’s response here) the QAA have published the new, very short Code. There’s some commentary on Wonkhe here. It really is short – in a 7 page document there is only one real page of content – but there is more guidance to come. 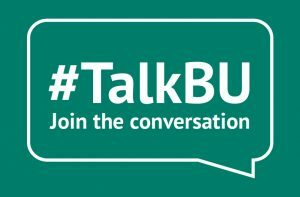 To inform our BU response to the HE Review all staff and students are invited to consider the issues in this (anonymous) 5-minute survey. Please take a look at the survey questions as we’d like to hear from as many staff and students as possible. You don’t have to answer all the questions! The major review of HE will shape the HE system, including how universities are funded for years to come. The survey will be available to staff and students until Friday 20th April. Financial factors were not the biggest influence on the final decision to apply to university. The most important factors were the desires to be more employable, to achieve the qualification and to pursue an interest in a subject. This was the case for applicants from both the higher and the lower socio-economic groups. Lower socio-economic group applicants placed a higher importance on grants, bursaries and living costs than applicants from higher socio-economic groups, although finance still remained a secondary influence on their decision to apply to university. The course offered (82 per cent of applicants), university reputation (58 per cent), and potential for high future earnings (41 per cent) were the most commonly cited major influences on applicants’ choices about where to study. Differences in bursaries offered, tuition fees charged and the ability to continue living at home were secondary factors when choosing where to study. These factors accounted for three of the bottom four of eleven factors tested that might influence which university to choose. However, they were more important for lower socio-economic group applicants. The maintenance loan, repayment threshold and particularly maintenance grants and university assistance were more important to members of the lower socio-economic group than the higher socio-economic group in alleviating cost concerns. And the government have published the outcomes of their 2014/15 student income and expenditure survey. There is a lot of data and there are lots of interesting charts, including figure 2.6 (the influence of financial support on my decisions), table 3.7 (what support English domiciled students received by mode of study), figure 4.3 (breakdown of total student expenditure (this one excludes the tuition fee but there is also a chart that includes it), figure 4.4 (total expenditure and housing costs). The data from both these reports will be pored over to support responses to the HE review. unduly complicated and cautious guidance from the Charity Commission. Groups or individuals holding unpopular opinions which are within the law should not be shut down nor be subject to undue additional scrutiny by student unions or universities. 41 The imposition of unreasonable conditions is an interference on free speech rights. We do not, for example, consider it a reasonable condition that, if a speaker gives an assurance that their speech will be lawful, they be required to submit a copy or outline of their speech in advance. if students are deterred from inviting speakers by complicated processes and bureaucratic procedures. It is clear that, although not widespread, all these problems do occur and they should not be tolerated. 60 Whilst there must be opportunities for genuinely sensitive and confidential discussions in university settings, and whilst the original intention behind safe space policies may have been to ensure that minority or vulnerable groups can feel secure, in practice the concept of safe spaces has proved problematic, often marginalising the views of minority groups. They need to co-exist with and respect free speech. They cannot cover the whole of the university or university life without impinging on rights to free speech under Article 10. When that happens, people are moving from the need to have a “safe space” to seeking to prevent the free speech of those whose views they disagree with. Minority groups or individuals holding unpopular opinions which are within the law should not be shut down nor be subject to undue additional scrutiny by student unions or universities. 91 Universities must strike a balance to ensure they respect both their legal duty to protect free speech and their other legal duties to ensure that speech is lawful, to comply with equalities legislation and to safeguard students. It is clearly easier to achieve this if debate is carried out in a respectful and open way. But the right to free speech goes beyond this, and universities need to give it proper emphasis. Indeed, unless it is clearly understood that those exercising their rights to free speech within the law will not be shut down, there will be no incentive for their opponents to engage them in the debate and therefore to bring the challenge that is needed to develop mutual understanding and maybe even to change attitudes. 93 It is reasonable for there to be some basic processes in place so that student unions and universities know about external speakers. Codes of practice on freedom of speech should facilitate freedom of speech, as was their original purpose, and not unduly restrict it. Universities should not surround requests for external speaker meetings with undue bureaucracy. Nor should unreasonable conditions be imposed by universities or student unions on external speakers, such as a requirement to submit their speeches in advance, if they give an assurance these will be lawful. The Migration Advisory Committee (MAC) has published its interim update on the impact of EEA and non-EEA workers in UK labour market. This is the first MAC inquiry of two – the second one is the one about students, this was more general and about workers across all sectors. The update sets out a summary of the views expressed by employers and of the regional issues raised. They add that “these themes seem the best way of summarising the views expressed to us but should not be taken to imply that the MAC endorses a sectoral and/or regional approach to post-Brexit migration policy.” The MAC has also published the responses to their call for evidence, broken down by sector. The vast majority of employers do not deliberately seek to fill vacancies with migrant workers. They seek the best available candidate. Employers often reported skill shortages as one reason for employing EEA migrants. Many EEA workers are in jobs requiring a high level of skill that take years to acquire. But, some of the claims about necessary skill levels seemed exaggerated. Within occupations, EEA migrants are better educated than their UK-born counterparts. The MAC view is that, from the economic perspective this does amount to saying that it is sometimes possible to hire a given quality of worker for lower wages if they are an EEA migrant than if they are UK-born. To the extent that EEA migrants are paid lower wages than the UK-born this may result in lower prices, benefitting UK consumers. Our final report will also consider these possible impacts. Many responses argued that a more restrictive migration policy would lead to large numbers of unfilled vacancies. The MAC view is that this is unlikely in anything other than the short-term. The MAC view is that it is important to be clear about what the consequences of restricting migration would be. This week is the launch of UKRI – it is worth looking at their objectives. The REF panels have also been announced – follow this link to see the lists. To ask the Secretary of State for Education, whether his Department is taking steps to ensure that prospective undergraduates understand the potential effect of their choice of course on their prospects post-graduation. A Sam Gyimah MP The department is working to make destinations and outcomes data more accessible to prospective students, to help them compare opportunities and make informed choices about where and what to study. On the 12 March 2018, I announced an Open Data Competition. It will use government data on higher education providers so that tech companies and coders can create websites to help prospective students decide where to apply. This competition will build on the government’s Longitudinal Educational Outcomes (LEO) dataset, which gives information on employment and salaries after graduation. Alongside this, my right hon. Friend, the Secretary of State has requested that the Office for Students include LEO data on the Unistats website as soon as possible. Q Angela Rayner MP To ask the Secretary of State for Education, what estimate his Department has made of the value of plan 1 student loans that will not be repaid. Q Angela Rayner MP: To ask the Secretary of State for Education, with reference to the written ministerial statement of 31 October 2017 on government asset sale, HCWS205, what methodology his Department used to decide which loans from the plan 1 loan book would be sold. A Sam Gyimah MP: The loans sold in December 2017 were a selection of loans from the plan 1 loan book issued by English Local Authorities that entered repayment between 2002 and 2006. These loans had the longest history of repayments, the longest servicing history and the most accurate data on borrowers’ historic earnings. This information allowed the government to most accurately value these loans for sale. The government’s objective when issuing loans to students is to allow them to pursue their education regardless of their personal financial situation. Once this objective has been met, however, retaining the loans on the government’s balance sheet serves no policy purpose. These loans could be sold precisely because they have achieved their original policy objective of supporting students to access higher education. Pursuant to Section 4 of the Sale of Student Loans Act 2008, a report on the sale arrangements was deposited in the House libraries on 7 December 2017 (deposit reference DEP2017-0778): https://www.parliament.uk/depositedpapers. Q: Angela Rayner MP: To ask the Secretary of State for Education, with reference to the written statement of 6 December 2017 on Government Asset Sake, HCWS317, what assessment he has made of the net fiscal effect of the sale of the student loan book after accounting for reduced income arising from lost repayments. A: Sam Gyimah MP: The government only sells assets when it can secure value for money for taxpayers from doing so. In assessing the value for money of the sale, the government took into account repayments foregone on the loans sold. In executing the sale, we achieved a price that exceeded the retention value of the loans sold, calculated in line with standard HM Treasury green book methodology. Selling financial assets, like student loans, where there is no policy reason to retain them, where value for money can be secured and where borrowers are not impacted is sound asset management. The sale ensures government resources are being put to best use and is an important part of our plan to repair public finances. Today BMC Pregnancy & Childbirth published the latest paper by a PhD student at Bournemouth University. 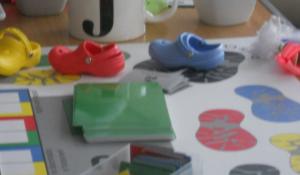 Our congratulations go to Alice Ladur in the Centre for Midwifery, Maternal & Perinatal Health (CMMPH), who published `Whose Shoes?’ Testing an educational board game with men of African descent living in the United Kingdom . This paper is based on her PhD research and co-authored with her supervisors. The paper addresses issues around men’s involvement in programmes or interventions aimed at the improvement of maternal health. One such innovative intervention is an educational board game which offers a unique approach to present health information where learning is reinforced through group discussions supporting peer-to-peer interactions. The authors would like to thank Gill Phillips for permission to use the Whose Shoes? board game and all participants for their participation in the PhD study. Alice PhD is focused on Uganda and this particular paper reports a qualitative study with men from Uganda who live in the UK on their views of an educational board game. This pilot study explored perceptions on whether a board game was relevant as a health promotional tool in maternal health prior to implementation in Uganda. Congratulations to Daisy Wiggins in the Centre for Midwifery, Maternal & Perinatal Health (CMMPH) on the publication of her paper ‘The effect of a birthplace decision support tool on women’s decision-making and information gathering behaviours during pregnancy: mybirthplace study protocol’. The paper is published in the Open Access journal Journal of Innovation in Health Informatics and can be accessed by clicking here! The paper is co-authored by CMMPH’s Prof. Vanora Hundley, Dr. Carol Wilkins, as well asProf. Carol Bond (University of Wolverhampton) and the Chief Executive of the Royal College of Midwives (RCM) Gill Walton. 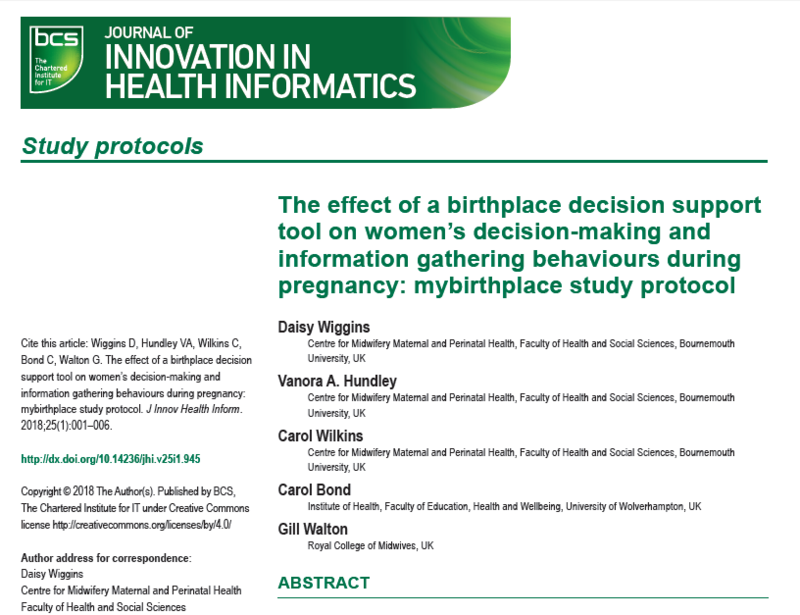 Wiggins D, Hundley VA, Wilkins C, Bond C, Walton G. The effect of a birthplace decision support tool on women’s decision-making and information gathering behaviours during pregnancy: mybirthplace study protocol. J Innov Health Inform.2018;25(1):001–006. Congratulations to Mrs. Preeti Mahato on the acceptance of her paper ‘Qualitative evaluation of mental health training of Auxiliary Nurse Midwives in rural Nepal’ by Nurse Education Today, an academic journal published by Elsevier. Preeti is currently registered as PhD student in the Centre for Midwifery, Maternal & Perinatal Health (CMMPH). The paper is co-authored by CMMPH’s Catherine Angell and Edwin van Teijlingen as well as BU Visiting Faculty Padam Simkhada and Jillian Ireland. The paper is a result of the evaluation part of the ‘Mental Health Training for Community-based Maternity Providers in Nepal’ project and written on behalf of this THET team. Our THET project in Nepal is a collaboration between the Centre for Midwifery, Maternal & Perinatal Health (CMMPH), Tribhuvan University (Nepal’s oldest university) and Liverpool John Moores University (LJMU). The project receives funding from DFID, and is managed through THET and supported locally in Nepal by a charity Green Tara Nepal. Edwin van Teijlingen, Padam Simkhada, Shyam K Maharjan Preeti Mahato, Bhimsen Devkota, Padmadharini Fanning, Jillian Ireland, Bibha Simkhada, Lokendra Sherchan, Ram Chandra Silwal, Shyam K Maharjan, Ram K Maharjan, Catherine Angell, Flora Douglas. At meetings we discuss issues following two presentations, and share our on-going work into humanising practice in education, practice and research. 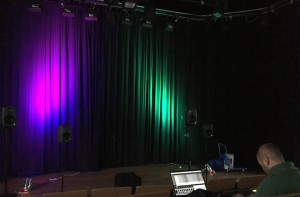 On Wednesday 28th February 2018 guest composer Dr Annie Mahtani, University of Birmingham and Birmingham Electroacoustic Sound Theatre (BEAST), joined us for a concert of multi-channel, surround-sound music for Loudspeaker Orchestra in the Allsebrook Lecture Theatre. Organised by Ambrose Seddon (EMERGE; Creative Technology), the varied programme featured works from BEAST and BU composers. Annie Mahtani presented and diffused three of her own multi-channel compositions (Inversions; Past Links; Aeolian) along with works by fellow BEAST composers James Carpenter (Pent-Up) and Nikki Sheth (Orford Ness). Ambrose Seddon diffused his recent multi-channel electroacoustic work Traces of Play while Panos Amelidis (EMERGE; Creative Technology and pictured sound-checking) diffused two compositions: Bird Train and Cracks. 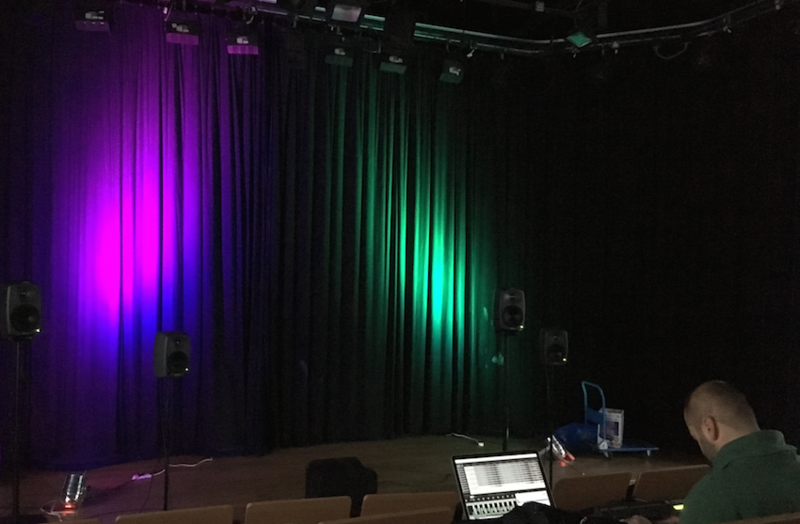 Student volunteers from our BSc Music & Sound Production Technology provided crucial help rigging the loudspeaker system – they also gained invaluable insights into novel surround-sound loudspeaker configurations. Thanks to all who attended and persevered despite the cold conditions!